Iza Calzado's Unicorn-Themed Birthday Party Is ~Pure Magic~! Headlines, hot news, and conversation starters on August 16, 2017! 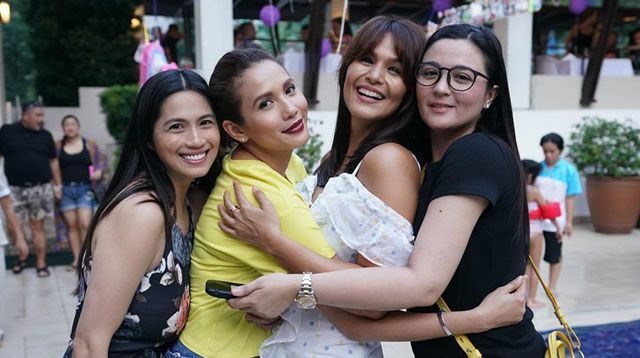 1 Iza Calzado finally made her dreams come true; the A Love To Last star threw herself a unicorn-themed birthday party! The pool venue was decked out in blue, purple, and pink balloons as well as unicorn and rainbow floaties. Diana Zubiri-Smith, Karylle, and Sunshine Dizon all showed up for the birthday girl. 3 ICYDK, Anna Faris has a podcast called Anna Faris Is Unqualified. Well, during her first podcast since the announcement of her split from Chris Pratt, Anna took a moment to thank her fans. She said, "Hey, dear listeners: I just want to thank you all so much for all the love I've been receiving, and I truly love you." The rest of the podcast was pre-taped. 4 Every real Tom Cruise fan out there knows that the Hollywood star is famous for doing all of his crazy stunts. So when Paula Patton starred alongside Tom in Ghost Protocol, she was inspired to execute all her stunts as well. In an interview, Paula told Jimmy Kimmel, "I don't know if it was pressure but it was like a competitive spirit. You wanted to do it too." 5 Uh-oh! It looks like some Korean Arianators aren't exactly happy with their idol. On August 15, Ariana Grande was scheduled to perform in Seoul as part of her Dangerous Woman Tour; she was supposed to arrive from Japan on August 14, but there have been reports that she "delayed her arrival in order to avoid the press." Ariana arrived just three hours before her concert, which meant that fans who purchased VIP tickets didn't get to watch the singer during rehearsals as scheduled. These fans requested for refunds. Because of time constraints, the meet and greet was also supposedly shortened.